The lizard clan. A warrior’s shield. And a fake? That's the question posed by the Utah Valley's Daily Herald about the dual mysteries of petroglyph building blocks. 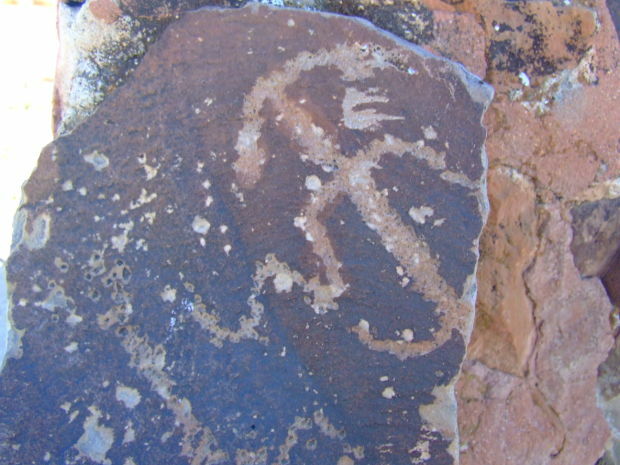 Hidden in plain sight, feet from the visitor’s center at Camp Floyd State Park, is a collection of Utah Valley’s most antique art — Native American glyphs. Etched on stone, the art was gathered from 5-Mile Pass a century ago and was used as the building blocks for a monument to honor the area’s history. So what's the mystery? First, two of the stones are clearly graffiti, signed with the year they were made. Though hard to read, one appears to be 1915. The second is clearly dated 1935 — just four years before the monument was built. Why contemporary graffiti would be proudly displayed in a monument meant for the ages is, well, a mystery. Second, one of the glyphs might be a contemporary fake. Shown photos by the Daily Herald, Richard Talbot of BYU’s Office of Public Archeology said one image of a bird appears not to be old at all, but noted that conclusion is premature.